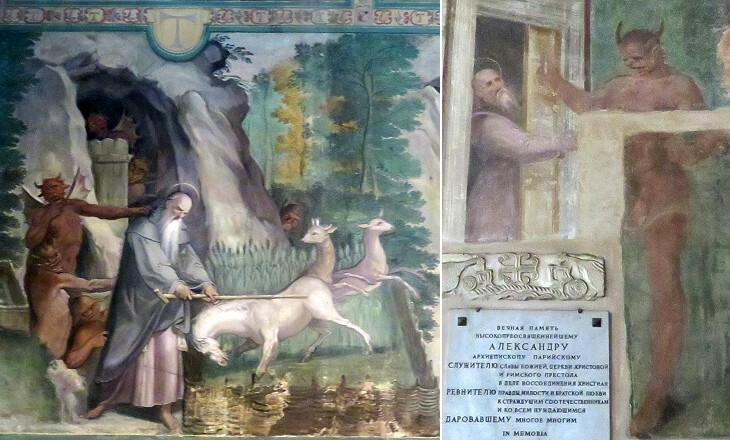 In several plates Vasi portrayed a stray dog; in this case perhaps he did it as a reference to St. Vitus whose help was sought by those who had been attacked by rabid dogs; the church of the Cistercian monastery was dedicated to Sts. Vitus and Modestus, two IVth century martyrs. The main objective of the view is the ancient arch which with some artistic licence Vasi used to frame Trofei di Mario, the ruins of an ancient monumental fountain. The view is taken from the green dot in the small 1748 map here below. In the description below the plate Vasi made reference to: 1) SS. Vito e Modesto; 2) Arco di Gallieno; 3) Trofei di Mario; 4) Monastero delle Viperesche. 3) is shown in another plate. The small map shows also 5) S. Antonio Abate; 6) Auditorium di Mecenate. The building which housed Monastero delle Viperesche has been widely modernized, the church underwent many changes and was given a medieval appearance it never had, the Roman ruins are no longer visible, yet the view is very picturesque even today. This because the site is almost hidden by late XIXth century tall apartment blocks and it comes as a surprise. Viperesche was not a reference to venomous nuns, but to Livia Vipereschi who founded an institution (1688) which cared for young women in danger, spinsters and widows. At Vasi's time the small monastery adjoining the church housed a few Cistercian monks (their main Roman monastery was at S. Croce in Gerusalemme, which is not very far away). A church dedicated to Sts. Vitus and Modestus is recorded in the area in the early IXth century. It was entirely rebuilt in the vicinity of the old location in 1477 by Pope Sixtus IV. In 1901 the orientation of the church was changed and a new façade was built on Via Carlo Alberto, a modern street. In 1973-977 the church was brought back to its original orientation and it was given a medieval looking façade. The two changes of orientation greatly impacted on the design and decoration of the interior which is now very bare, after the removal of all early XXth century additions. 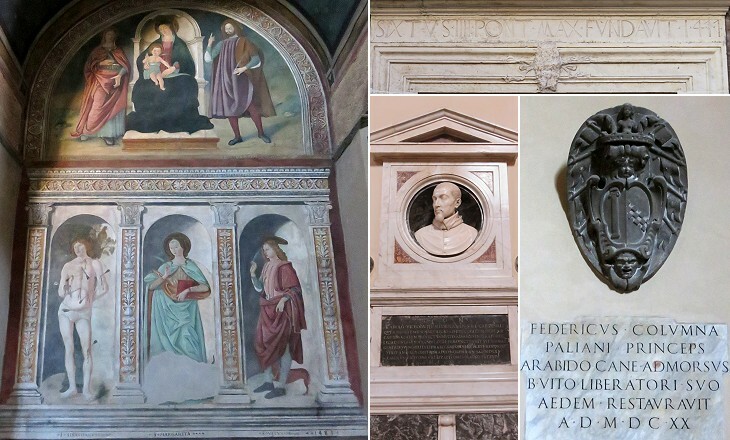 It retains however a good Renaissance fresco which was paid for by three families of Florentine origin (Peruzzi, Machiavelli and Federighi) and some memories of the church history. 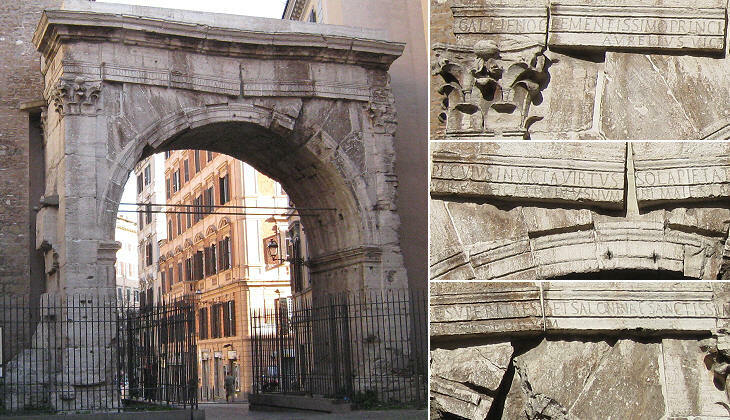 The arch was originally a gate (Porta Esquilina) of the Servian Walls; at the time of Emperor Augustus the gate was given a monumental appearance with two minor arches at the sides of the major one; there is evidence of an erased inscription of that time. 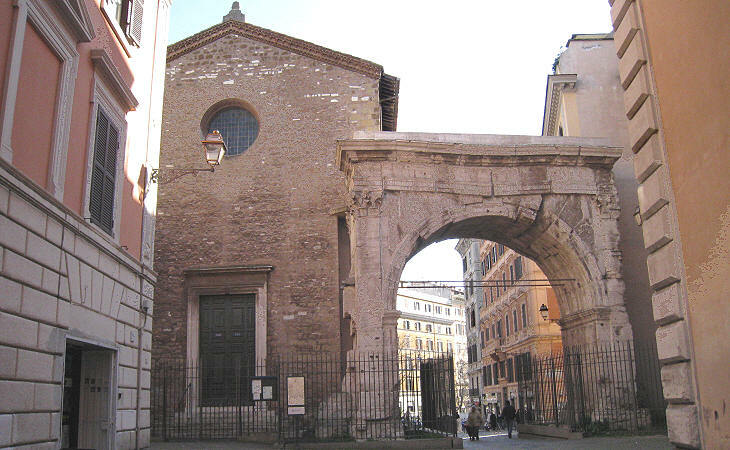 In 262 the arch was dedicated to Emperor Gallienus and his wife Salonina who owned a large estate outside the gate. In the new inscription the emperor was celebrated for his military leadership which was exceeded only by his piety. The two minor openings were demolished when the church was built. In 1259 Cardinal Pietro Capocci founded a hospital to cure those affected by herpes zoster, which in Italy was called St. Anthony's Fire and therefore it was dedicated to that saint (in other countries St. Anthony's Fire indicates ergotism or erysipelas). The Capocci were an important family at that time and they had their fortified houses in this part of Rome. In the following century a church was built on the premises of the hospital. The complex was modified many times until in 1932 it became the Pontifical Seminar for the Russian-Byzantine rite (thus now it is called Russicum). 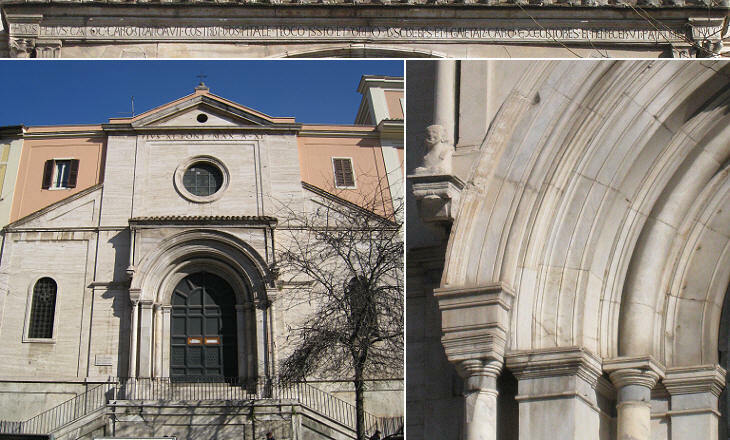 The portal of the hospital is today placed at the centre of the church façade (you may wish to see the church as it appeared in a 1588 Guide to Rome). S. Antonio Abate (St. Anthony the Great) is the patron saint of pack-animals, so once a year horses and donkeys were brought to the square in front of the church to be blessed. The ceremony was briefly described by J. W. Goethe in his Italian Journey (January 18, 1787). The ceremony now takes place at S. Eusebio. The interior of the church has been largely modified to adapt it to the Russian-Byzantine rite; the accesses to the main altar and to some chapels have been closed by iconostasis panels, but still some of the frescoes describing the continuous struggle between St. Anthony and the tempting devils can be seen. Junius Annius Bassus was a Roman officer at the time of Emperor Constantine and in 331 he was appointed consul. He built a small basilica in an area which was eventually included in the garden of the hospital of S. Antonio Abate. The building was perhaps a library or a small tribunal. In the late Vth century it was turned into a church dedicated to St. Andrew. The building was deconsecrated in the XIIIth century and it was used as a small warehouse for the hospital. In 1686 the apse collapsed and soon after some of the "opus sectile" panels which decorated the original basilica were acquired by the Massimo (and later on by the Del Drago) or moved to Musei Capitolini. 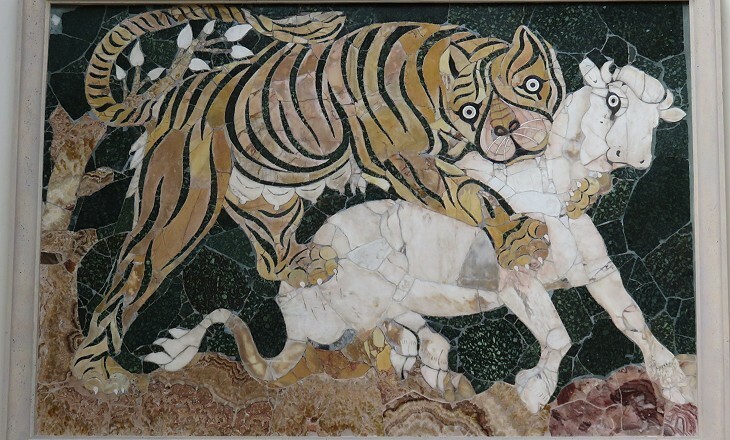 According to Pliny "opus sectile marmoreum" (facing of floors or walls by using pieces of marble) was introduced to Rome in the Ist century BC. Geometric examples of this technique can be seen at many places in Rome and its environs (e.g. 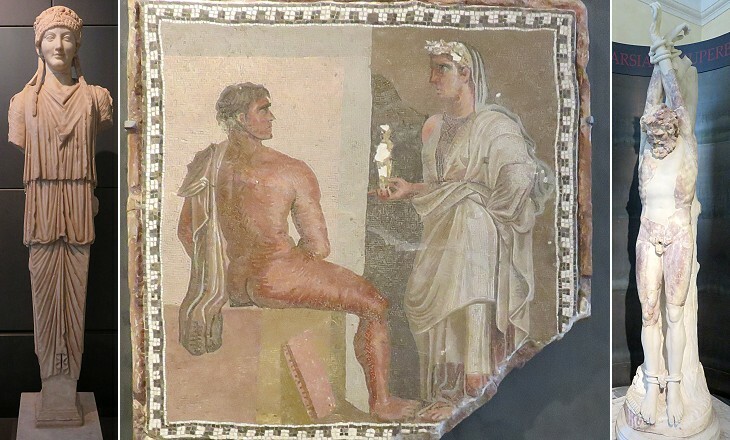 Villa Adriana at Tivoli and Domus del Ninfeo at Ostia), but the use of "opus sectile" to depict scenes was rather rare. The panels of Basilica di Giunio Basso were the largest known examples of this "painting" technique until the reconstruction in 2005 of those which had been found at Casa dell'Opus Sectile at Ostia in the 1960s. 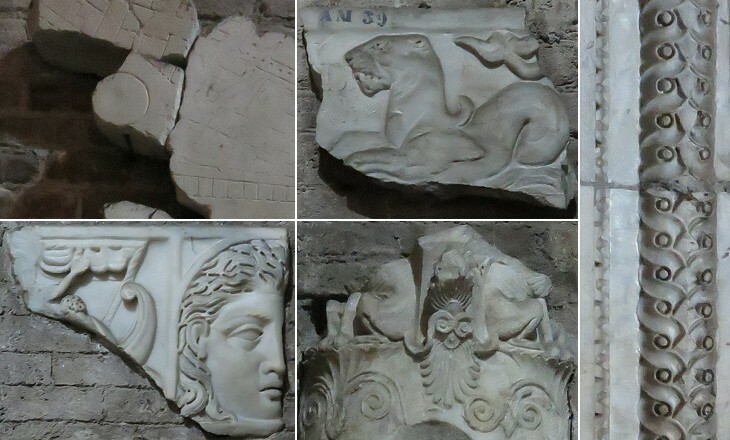 The reliefs which were made for Arco di Costantino (not those taken from other monuments) suggest a major decline in sculpture in the early IVth century. The "opus sectile" panels of the basilica indicate that the decline did not affect all aspects of art. 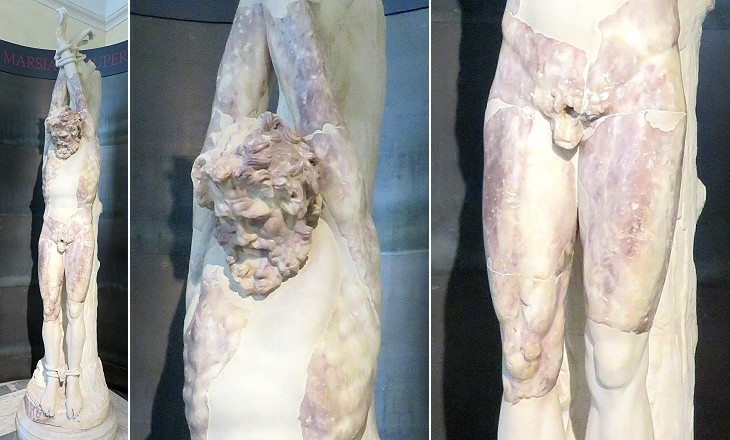 Small pieces of mother-of-pearl were used to give visibility to the nymphs' bracelets; the design of the bodies and in particular that of Hylas impressed many Renaissance artists who visited the basilica and copied its decorations. 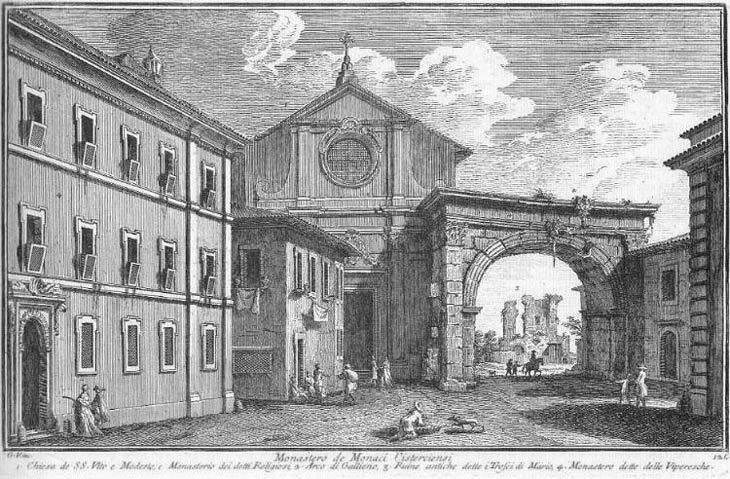 In 1874 an unusual ancient building was unearthed in a garden along Via Merulana, the street opened by Pope Sixtus V to link S. Maria Maggiore with S. Giovanni in Laterano. The area was known as the likely site of a suburban villa built by Gaius Clinius Maecenas, a friend of Emperor Augustus, and a patron of poets such as Virgil and Horace. The building is a large rectangular hall having at one end an apse with a series of circular steps. 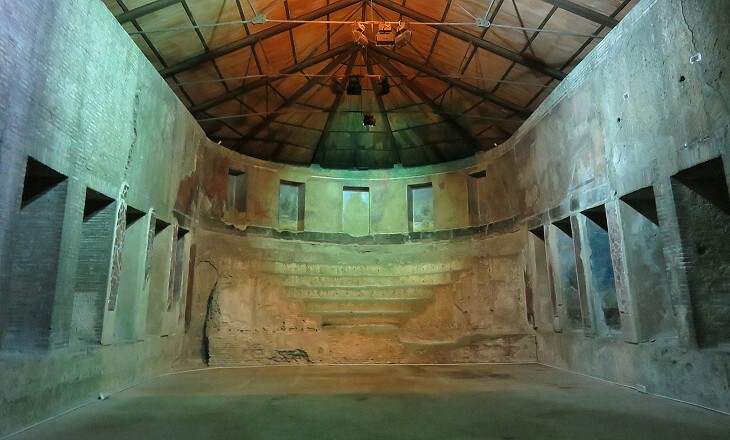 These were believed to seat a small audience, hence the name by which the building is usually referred to. Maecenas left all his fortune to Augustus and his villa was utilized and modified by Emperors Tiberius and Caligula. The building might have been used for different purposes by its owners, but there is a general consensus that the steep and narrow steps were part of a nymphaeum, a monumental fountain. Its water ended into a small canal at the centre of the hall, which in summer was perhaps used as a coenatio, a banqueting hall. The fresco decoration recalls in many aspects those at Villa di Livia and at the House of Augustus. 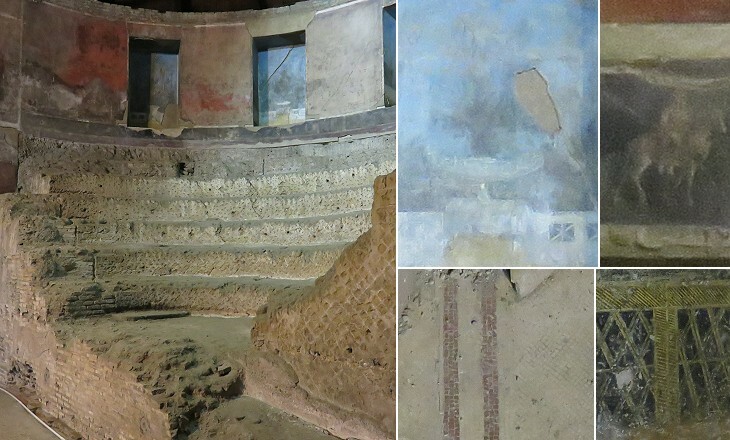 Nunc licet Esquiliis habitare salubribus (it is now possible to live salubriously on the Esquiline Hill) is a verse by Horace (Sermones Book VII) praising Maecenas that has helped archaeologists in identifying the ancient owner of the building. Actually Maecenas' villa replaced a cemetery which stood immediately outside the Servian Walls. Molem propinquam nubibus arduis/ Omitte mirari beatae/ Fumum et opes strepitumque Romae (leave../ Those piles, among the clouds at home;/ Cease for a moment to admire/ The smoke, the wealth, the noise of Rome! - Translated into English verse by John Conington). According to tradition Emperor Nero watched the 65 AD fire of Rome from this tower. The exact size and location of Maecenas' property are difficult to be determined as well as the changes in its ownership. 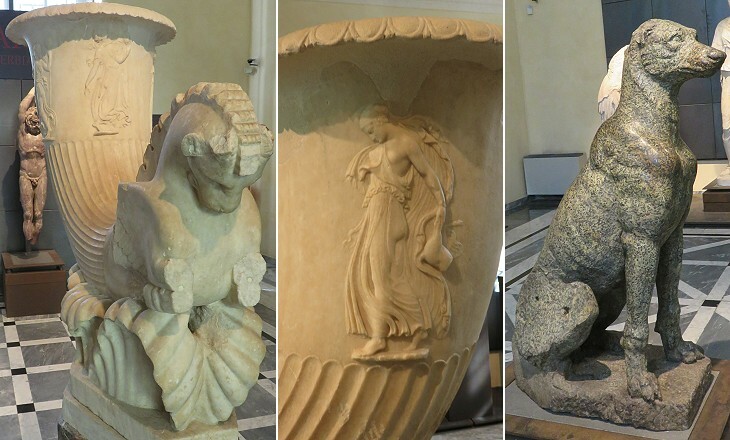 Musei Capitolini has dedicated a hall to the sculptures which were found in its assumed site. Many of them decorated gardens (horti) and they might have been made at the time of Maecenas. 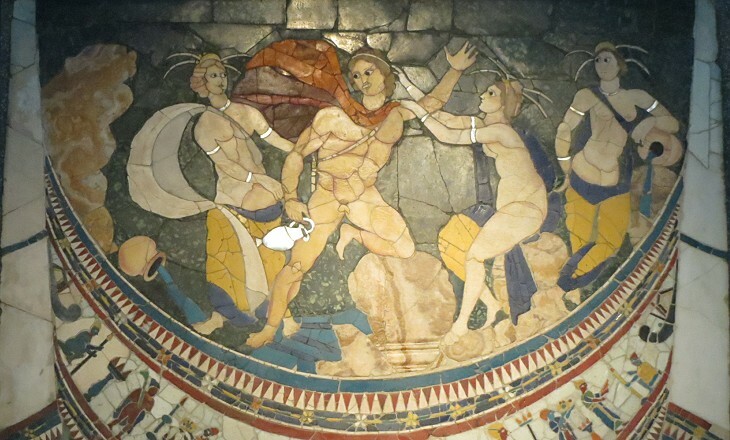 The Romans were familiar with Greek history and myths well before they conquered that country in 146 BC. The subjects depicted in the works of art which decorated their residences were very often related to Greece and in the case of statues they were copies of ancient Greek originals. 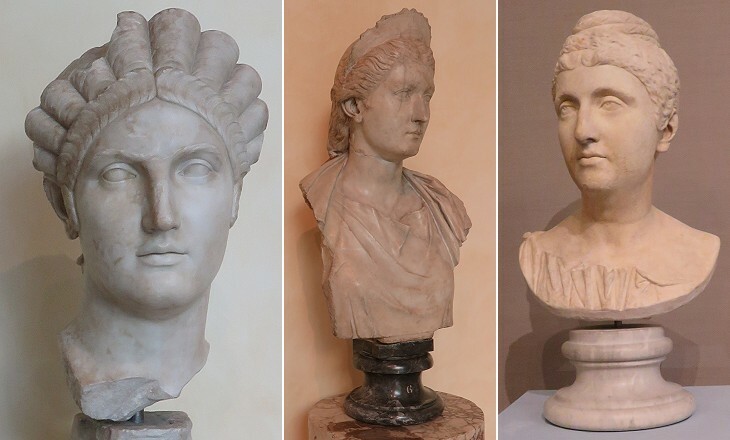 A number of statues of Roman emperors and their relatives were found in the vicinity of Maecenas' gardens. The heads of statues in the images above show a sort of female dynasty who ruled the Empire in the IInd century AD. It continued with Annia Galeria Faustina the Younger, Matidia's great granddaughter, who married Emperor Marcus Aurelius. Next plate in Book 7: Convento dei Padri di S. Bernardo. Next step in Day 2 itinerary: Basilica di S. Maria Maggiore. Molto antica ed ancora di somma venerazione è questa chiesa, perchè da quello, che si legge, quivi fu il macello Liviano, in cui furono poi martirizzati moltissimi Cristiani: perciò sono in essa de' corpi di santi Martiri, e la pietra sopra cui furono uccisi a guisa di bestie da macello: onde fu detto questo luogo macellum martyrum. 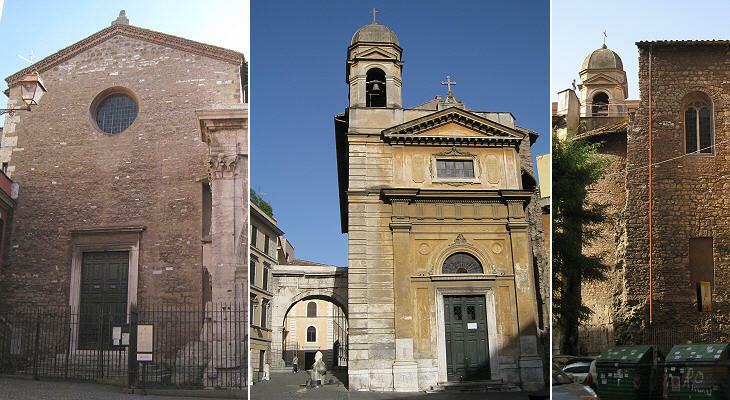 Custodiscono questa chiesa li Monaci Cisterciensi, e vi risiede il di loro Procuratore Generale. L'an. 1259. fu eretta questa chiesa insieme collo spedale per un legato del Card. Pietro Capocci, a favore de' poveri scottati dal fuoco, e però sono custoditi da' Canonici di sant' Antonio di nazione Francese. La cappella del santo Titolare e l'altra a sinistra dell'altare maggiore furono dipinte dal Pomaranci, e la vita del Santo dipinta intorno alla chiesa è di Gio. Batista Lombardelli Marchigiano. I laterali fatti di nuovo nel cappellone sono di Monsù Parosel Avignonese; e la croce di pietra, che si vede dinanzi, la chiesa vi fu posta l'an. 1745. invece del ciborio, elle vi era prima, caduto per l'antichità, e vecchiezza.